These are just some of the color options for Hadoro AirPods. Apple’s AirPods are more than wireless headphones; they’re fashion accessories. 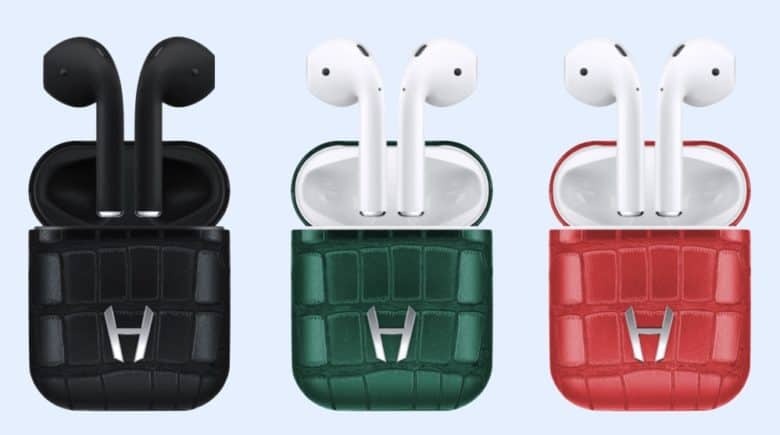 Hadoro AirPods take that to the next level by using alligator leather to make something any starlet or internet billionaire could be proud to be seen carrying. The French company produces these cases in seven different colors. A black version includes a pair of matching black AirPods. Hadoro promises that it “carefully selects and handcrafts only the finest leathers sourced in the southeastern United States.” They are designed to match leather-bound iPhone cases and Apple Watch straps. The company’s H emblem is made from stainless steel. To be clear, these are regular Apple cases that have simply been covered in leather. Their functionality is unchanged, only the appearance is different. In addition to black, case color options include green, red, burgundy, brown blue, and navy blue. Luxury doesn’t come cheaply, and Hadoro’s alligator leather AirPods are €550 (~$657), as compared to €159/$159 for a standard pair. The all-black version is €590 (~$704). The Hadoro AirPods are available on the company’s website, as well as at London’s Harrods, Nous in Paris, and Ali Bin Ali in Qatar.